Toby Wren is a composer and improviser with a Master's in music performance and PhD in ethnomusicology. 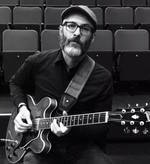 He currently lectures media and cultural studies at SAE, and teaches jazz guitar at the Queensland Conservatorium Griffith University. Toby has had orchestral pieces performed by the Queensland Orchestra, West Australian and Sydney Symphony orchestras, Southern Cross Soloists and Topology, written arrangements for rock bands like George, Rhubarb, Blind and Chris Pickering. He has been a member of countless jazz, rock and new music groups as a guitarist. He was also a member of the composers collective Compost (1996-2004). Since 2005, Wren has focused on composing for his various ensembles, the Toby Wren Trio/Quartet, the Carnatic Jazz Experiment and Cows at the Beach. As an improvising guitarist his mastery of styles and incorporation of unusual elements into performance and composition have seen his groups achieve national recognition. The Toby Wren Trio's 2006 release Umlaut was launched at the Brisbane Powerhouse and the Brisbane Festival Spiegeltent and toured nationally in 2007 with assistance from the Contemporary Music Touring Program (DCITA). In 2009 he released Everything Must Go, which featured world saxophone competition winner Jamie Oehlers. Since 2006 Toby has been collaborating with musicians from the Carnatic (South Indian classical) music tradition. In India, he has studied with Guru Kaaraikkudi Mani, U Srinivas, Palghat Raghu, Abhishek Raghuram, and Prasanna. After returning from India, Wren formed the Carnatic-Jazz Experiment which has explored the middle ground between these two improvising cultures (CD release, 2011). He has also produced several iteratrions of the Cows at the Beach concerts, including a performance in which he collaborated with Kaaraikkudi Mani's Sruthi Laya Ensemble in 2013. These studies have informed his later work, in particular the CD Rich and Famous (2012), a jazz quartet recording with compositional and rhythmic structures based on Carnatic music practice. In 2016 he will release his 6th studio recording Black Mountain. Ears : for electric superorchestra (1999) Commissioned by Compost Composers Collective.